Along with the Stretched Cluster feature that arrived in Virtual SAN 6.1 (vSphere 6.0 U1) another feature that was delivered is the Remote Office Branch Office (ROBO) solution.? For many months customers who typically have a remote office branch office vSphere solution were not best pleased at the fact they needed a minimum of three Virtual SAN nodes per site.? With the ROBO solution the minimum number of hosts per site has changed and the licensing for ROBO is different than the conventional Virtual SAN solution as well. ROBO solutions from VMware have been around for a while, there is a licensing model for vSphere that incorporates a ROBO solution, and in the days of VMware vCenter Storage Appliance (VSA) there was a ROBO solution for customers to have two ESXi hosts on site with a “Cluster” node as a thin client solution on site too, so technically you still needed three systems for VSA.? So how does Virtual SAN ROBO work? 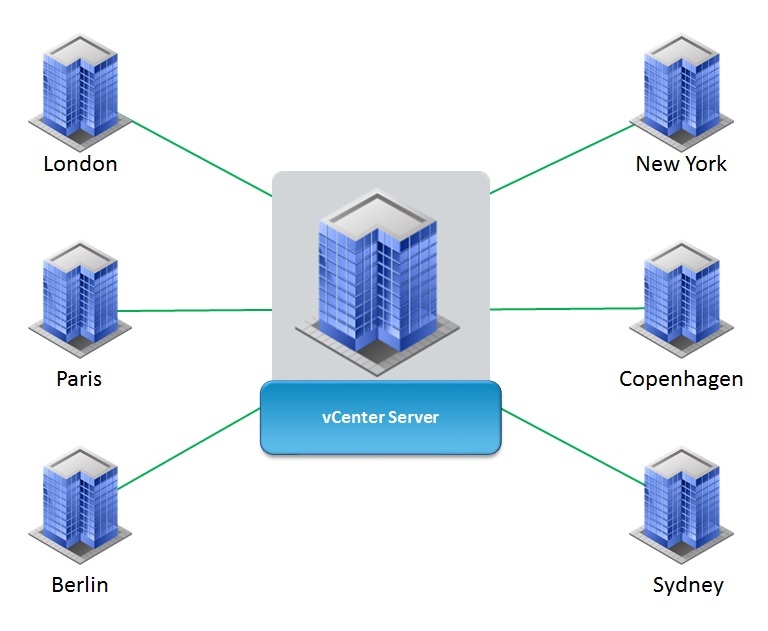 The above image is typical of a Remote Office – Branch Office setup, all remote site vSphere clusters are managed centrally by a single Virtual Center server over standard WAN links, with the vSphere ROBO license pack you can run up to 25 virtual machines per site or even split the 25 Virtual Machines across multiple sites for example have 5 individual sites running 5 virtual machines under a single 25 virtual machine ROBO licence.? The Virtual SAN license for ROBO is exactly the same, it is purchased in packs of 25 virtual machines and those can be spread across multiple sites the same way that vSphere ROBO licence can be. 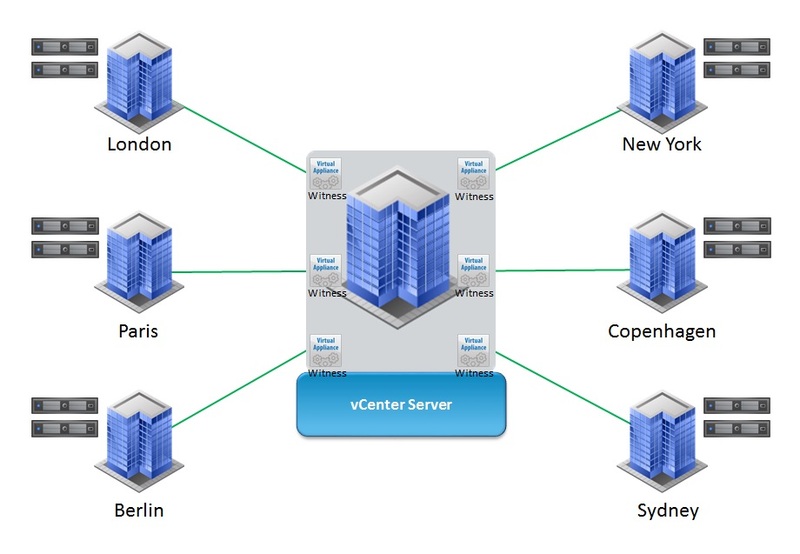 Each remote site will host two ESXi servers running Virtual SAN allowing the RAID1 of disk objects to be fulfilled, in the centralized office there will be a witness host for each remote site, the witness is a virtualised ESXi host and performs the same functions as in the Virtual SAN Stretched Cluster. The storage requirements for the witness appliance also remain the same at 15MB per disk object, the maximum being 25 Virtual Machines having 60 disks each resulting in a maximum storage requirement for the witness appliance of around 23GB. As you can see from the above diagram, the witness has to reside on a different network to the hosts to prevent I/O traffic flowing across the WAN link and back to the other ESXi host, however the requirements for latency are much lower than the Stretched Cluster, this is mainly down to the maximum number of virtual machines per site being 25 versus the potential 1000’s for the Stretched Cluster.? You will also notice that 1Gb networking between the two hosts on the remote site is fully supported, again this is due to the maximum number of virtual machines that can be ran on the remote site.? It is still recommended to use multiple interfaces as an Active/Standby configuration in order to recover in the event of a network interface failure. The main question I am asked is “Is it necessary to have a network switch on site”, the answer to this would be not necessarily, the VSAN VMKernel interfaces on the ESXi hosts have to be able to communicate with the Witness Appliance so they could be connected directly to a multiple port router that supports 1Gbps, in the event of a single port router a switch would be required, connecting a crossover cable between the ports on the hosts would not allow communication with the witness appliance and therefore it would not work. Virtual SAN ROBO will be sold in packs of 25 licenses, this pack can be split across sites or used on a single site, this basically means you can run a maximum of 1 site with 25 virtual machines or up to 25 sites with a single virtual machine, it is a single license per site so there’s no going above 25 virtual machines per site with the ROBO License, you can split the license as any ways as you want providing you do not exceed the 25 virtual machines. Hi Mr.vSan, do I need to buy a vSphere for Remote Branch Office licenses (Standard or Advanced) to run the vSAN for ROBO? Or is the vSphere for Remote Branch Office licenses includes to vSAN for ROBO?